Many Illinois state politicians and university administrators are blaming the state’s budget gridlock for higher-education funding shortfalls. But budget gridlock isn’t why Illinois’ higher-education system is facing financial troubles. The truth is that more than 50 percent of Illinois’ $4.1 billion budget for state universities is spent on retirement costs – making it easy to understand why there’s not money out there for much else. Rather than keep tuition low, Illinois colleges and universities have taken the flood of federal and state monies available to higher education over the past two decades and spent it on a massive increase in administrative positions and exorbitant executive compensation. That growth and those higher salaries have dramatically increased the cost of university pensions, causing the state to redirect a majority of its higher-education funds toward retirement costs. The state is now spending more money on retirement costs than on university operations. A decade ago, retirement costs made up only 20 percent of the state’s total higher-education spending. Today, that percentage has ballooned to 53 percent. As spending on retirements rose from 2006 to 2015, state spending on higher-education operations fell by over $150 million. Higher-education costs are out of control in every state, but Illinois adds an untenable pension crisis to the mix of too many administrators and budget bloat. Universities want to use Illinois’ 2015 budget crisis to blame the state for the mess the leaders of these schools have made, claiming the state’s lack of appropriations has made college less accessible to lower-income students. But the fact is the universities’ own out-of-touch policies have led to a spike in student tuitions of nearly 100 percent in the past decade. Skyrocketing tuition, driven by ever-increasing administrative costs and the higher-education pension crisis, has put college out of reach for many Illinoisans. Even a cursory look at student tuition rates shows that Illinois’ public universities’ bloated spending and growing administrative staffs have bumped up tuition at an alarming rate. 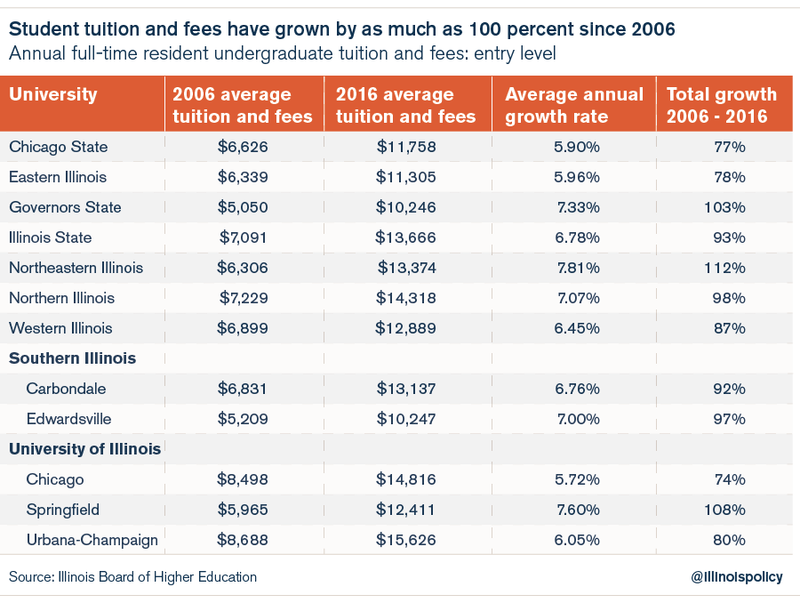 According to the Illinois Board of Higher Education, tuition has been increasing dramatically at Illinois’ public universities for more than a decade. Combined student tuition and fees grew anywhere from 74 to 112 percent between 2006 and 2016, depending on the university. At Northeastern Illinois University, the average annual cost of tuition and fees has gone up by 112 percent, to $13,374 in 2016 from $6,306 in 2006. And at the University of Illinois at Urbana-Champaign, the campus with the highest tuition and fee costs in the state, average tuition now costs $15,626 annually, up 80 percent since 2006. By comparison, the national average of in-state tuition and fees at four-year public institutions was $8,893 for the 2013-2014 school year. Over the past decade, Illinois colleges and universities have extracted hundreds of millions of dollars in extra tuition and fees from students, using the excuse that state appropriations to higher-education operations have declined. Escalating costs having nothing to do with education and instruction have made college all but unaffordable for lower-income students. It used to be that students could work to pay for their education while attending college, but with such steep increases in tuition costs, that is no longer an option. Public colleges and universities are responsible for the biggest driver behind the higher-education funding crisis: Namely, the incredible size and cost of college and university administrations. Thus, Illinois has contributed to the decadeslong, national trend of dramatically declining administrator-to-student ratios. In 1975, the administrator-to-student ratio for higher-education institutions nationally was 1 administrator for every 84 students. By 2005, the nationwide ratio had declined to 1-to-68. In Illinois, the ratio has fallen even further. In 2011, the average administrator-to-student ratio for Illinois’ public universities was approximately 1-to-45. Chicago State University had the lowest ratio of all, with 18 students for every one administrator – very close to the university’s faculty-to-student ratio of 1-to-16. Not only have colleges and universities massively expanded their number of administrators, but they have also been paying administrators exorbitant salaries. According to the Illinois Board of Higher Education, over half of Illinois’ 2,465 university administrators received a base salary of $100,000 or more in 2015. 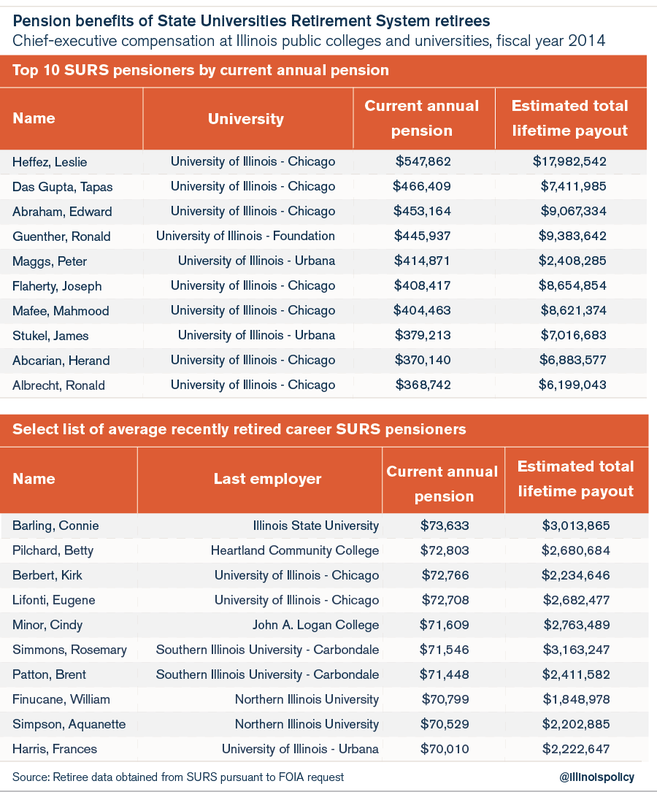 Ninety-five percent of the University of Illinois system’s top 126 administrators made $100,000 or more as a base salary. Those high salaries themselves impose a heavy cost on universities – and they are only a part of administrators’ overall compensation. The College of DuPage’s compensation practices are a perfect example of the administrative extravagances paid by Illinois colleges and universities. The college’s special compensations and large termination payments granted to then-President Robert Breuder resulted in a scandal that prompted Illinois lawmakers to review the entire practice of administrative compensation in higher education. 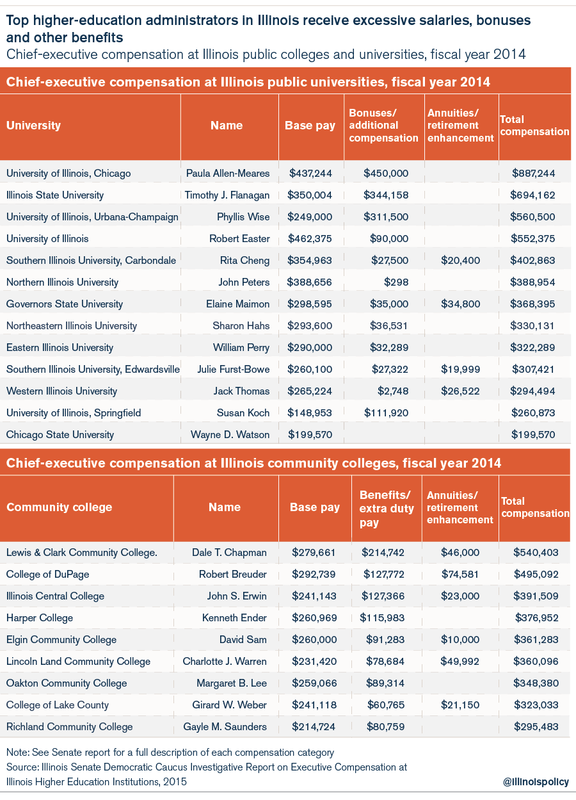 Even the top-compensated administrator in 2014, the University of Illinois’ Chancellor Paula Allen-Meares, received much of her total compensation in the form of a bonus. The chancellor received a base salary of $437,244 and a bonus retention incentive of $450,000, bringing her annual compensation to $887,244. While Illinois politicians are responsible for decades of pension underfunding and the granting of overgenerous pension benefits, Illinois’ university and college officials must also share the blame for the higher-education pension crisis. The problem has never been revenue, but bloat and overspending. The top beneficiary in SURS is Leslie Heffez, an oral surgeon who retired from the University of Illinois at Chicago in 2012. Heffez currently draws a $547,000 annual pension and, assuming a current life expectancy of 81 years, he’ll receive nearly $18 million in pension benefits over the course of his retirement. And while Heffez is by far the top pensioner in SURS, he’s not the only university retiree who will receive millions in total pension benefits. The average SURS career worker (30 years or more of service) who has recently retired will receive a starting pension of $71,600 and also earn more than $2 million in retirement benefits over the course of his or her retirement. By the time Pilchard reaches her approximate life expectancy of 84, her annual pension will have increased to $154,306 a year. This is because the 3 percent cost-of-living adjustment, or COLA, she receives every year causes her original $71,551 annual benefit to build upon itself, doubling Pilchard’s benefit in 25 years, to $145,448. To be clear, university workers who earn these generous pension benefits have done nothing wrong. They’re benefiting from labor negotiations that have led to lucrative compensation packages. However, it’s also clear that these benefits are no longer fair or affordable for Illinois taxpayers. The generous five- and six-figure annual benefits and million-dollar payouts the average SURS pensioner receives due to overgenerous salary levels, retiring in their 50s, longer life expectancies and 3 percent COLAs have put tremendous strain on the university pension system and the state. 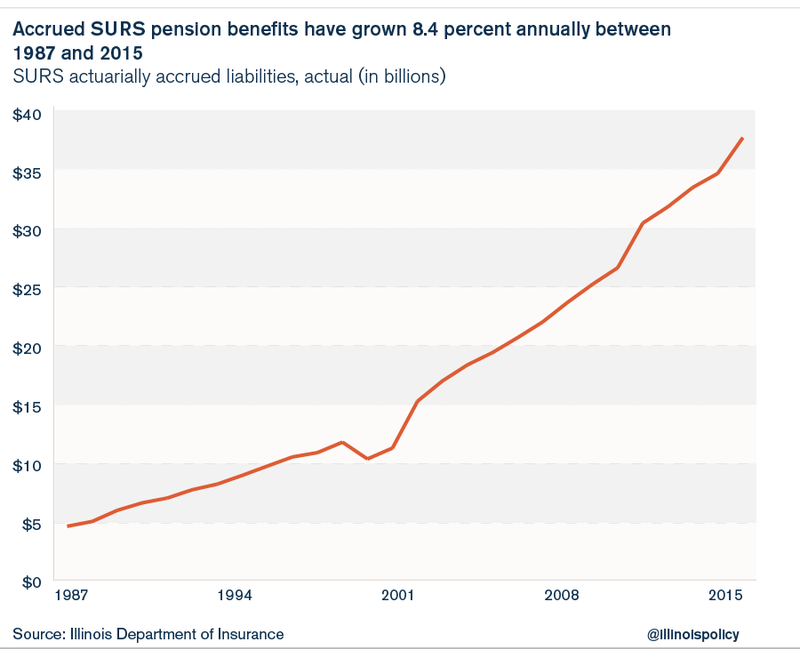 According to the Illinois Department of Insurance, the total annual pension benefits for SURS members (the benefits accrued by all pensioners) have grown at the incredible pace of 8.4 percent annually since 1987, to $37 billion in 2014 from just $4.2 billion in 1987. That growth rate far surpasses the growth rates of state revenues, inflation, gross domestic product and taxpayer incomes during the same period. Thus, the benefits promised to university pensioners are growing at such a rapid rate that state appropriations cannot possibly keep up with them in the absence of pension reform. 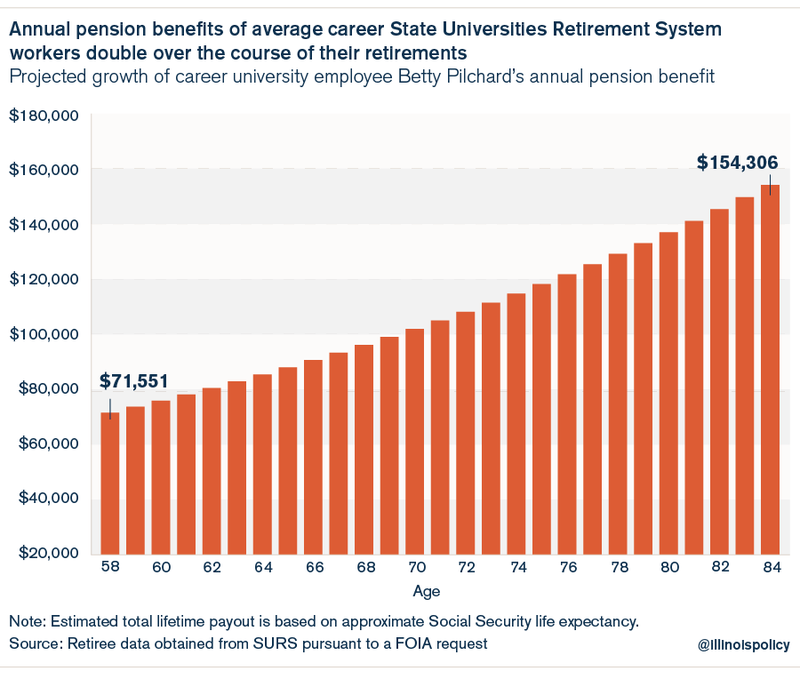 This growing cost of pensions is one of the reasons the state is pouring billions of higher-education appropriations into retirement costs rather than university operations. University officials have complained for years about the state’s lack of commitment to higher education, perpetuating the myth that the state’s appropriations have been in steady decline. But state funding has increased by more than 60 percent over the last decade, growing to over $4.1 billion in 2015 from $2.5 billion in 2006.18 Unfortunately, a majority of that money has gone toward retirement costs, not classroom instruction. The state of Illinois’ annual spending on higher education comprises more than just appropriations to Illinois’ universities and community colleges. It also officially includes the state’s share of contributions to SURS, the state-university employees’ pension fund. In addition to paying pension contributions to SURS, the state is also responsible for other retirement expenses. While not part of the official budget for higher education, the state also pays for a portion of the costs of health insurance for retired university workers through the College Insurance Program, as well as through the State Employees Group Insurance Program. Illinois must also pay down the portion of the state’s annual pension obligation bond payments, or POBs, allotted to SURS. 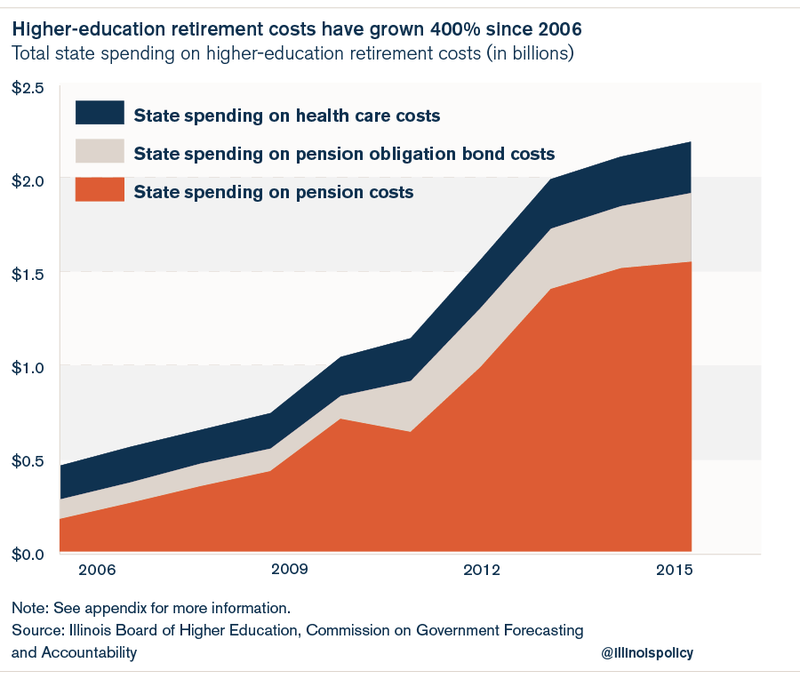 In 2003, 2010 and 2011, Illinois borrowed a total of more than $17 billion in POBs to pay for annual contributions to the five state-run pension systems.19 Now the state has to pay back SURS’s share of those bonds over a period of time, which adds additional costs to university retirement spending. In all, state spending on university retirements has grown to almost $2.2 billion in 2015 from just $434 million in 2006. That’s an increase of over 400 percent, or a growth rate of 20 percent a year. The state’s increased contributions to university pensions have been the primary driver of the growth in higher-education retirement spending. State contributions to SURS alone (excluding health care and POB costs) have increased by over 800 percent since 2006, to over $1.5 billion in 2015 from just $170 million a decade before. As spending on retirements rose from 2006 to 2015, state spending on higher-education operations fell by over $150 million. 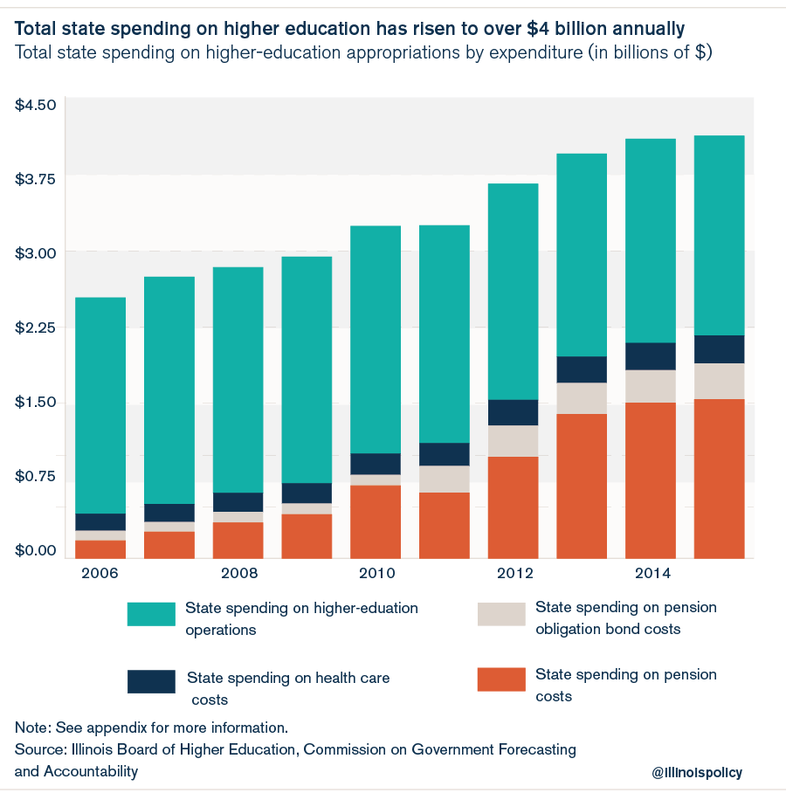 In fact, if you look at total higher-education spending from 2006 to 2015, the state added $8 billion in new dollars over and above the base amount of the $2.5 billion it spent in 2006. Of those new dollars spent, every single one went to pay for retirement costs. As a result, state spending on higher education has flipped. 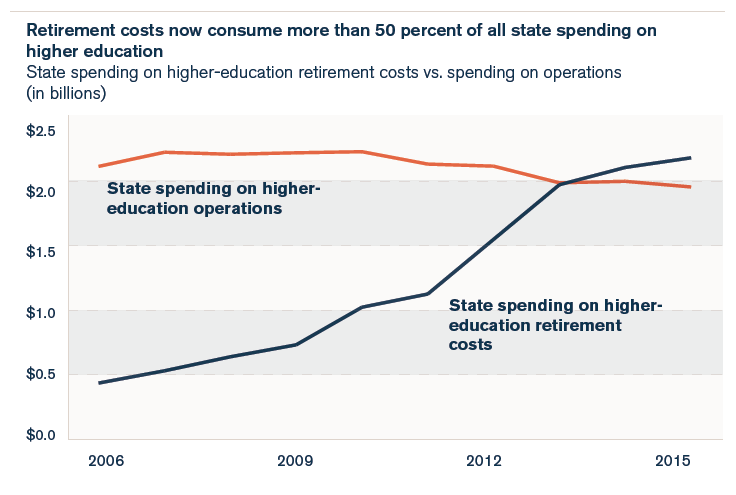 The state now spends more money on retirement costs than on university operations. 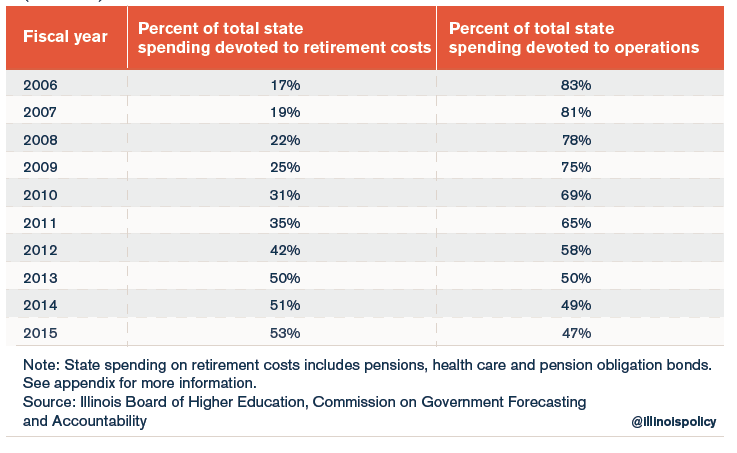 Retirement costs make up 53 percent of Illinois’ total higher-education spending. And with the state’s required pension contributions to SURS projected to rise even higher over the next decade, retirement costs can be expected to further crowd out operational funding. The higher-education crisis has not resulted from Illinois’ budget gridlock. Rather, skyrocketing pensions, bloated administrative costs and soaring tuition and fees for students have caused it. These are all self-inflicted wounds. To fix these problems, universities and the state will have to undertake important reforms, with the primary goal of increasing the accessibility of college for all students. To that end, Illinois’ colleges and universities must first freeze and begin to reduce the cost of tuition. They must reform their operational spending, reduce the cost of salaries and eliminate administrative bloat – then pass the resulting savings on to students. Until colleges and universities enact such reforms, the destructive circle of hiking tuition while relying increasingly on state subsidies will continue, which will make higher education less and less affordable. The state must also do its part to fix the problems with higher education. The excessive administrative salaries and generous pension benefits that have been granted to university workers have resulted in a retirement system that is unfair and unaffordable for the taxpayers who fund it. To remedy that problem, Illinois needs to move away from its broken pension systems – starting by moving new university workers onto 401(k)-style plans. That will be easy for university employees, as such a program already exists for them today. Almost 20,000 active and inactive members of SURS already participate in a 401(k)-style plan. These state-university workers control their own retirement accounts, which aren’t part of the increasingly insolvent pension system. In addition, enacting a constitutional amendment allowing Illinois to reform pension benefits for existing workers going forward will go a long way toward fixing the self-inflicted crisis in higher education.